As the summer season was coming to a end it was time to squeeze in a long awaited adventure, Swimming With Whale Sharks. Being laid up with rotator cuff surgery this summer I had to delay this adventure. Peak season for swimming with Whale Sharks off of Cancun is the last 2 weeks in July and first 2 weeks of August with the season ending on September 15th, so it was time to make a move and get this adventure going. Arriving from Sao Paulo into Miami on the morning of September 7th it was a quick flight out on the first flight to Cancun Mexico. Arriving in Cancun around 11 it was too late to do the swim, so it was planned for the next day, Saturday. 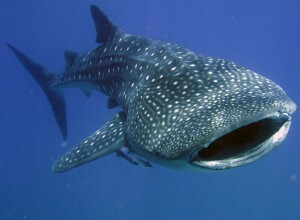 Swimming With Whale Sharks In Cancun you will find a dozen tour groups offering day trips to Swim With The Whale Sharks. These tours are regulated by the Mexican Government, Season being from May 15th till September 15th and the size of boats, In Cancun they use "Pangas" as they are called in Mexico. A Panga is a high bow outboard motor boat that holds about 14 to 15 people. Being regulated the tour companies limit the tours to 10 people per boat. Prices will range from around $140 to $200 depending on the tour company and what they offer. Only snorkeling and no scuba diving allowed. For this particular adventure we hooked up with Eco Color Tours of Cancun, we were picked up within a minute of our scheduled time at the hotel, 7:40 am. With a 20 minute ride through Cancun to the Eco Color Tours dock, Juan, our guide for the day gave a brief informative history and habits of Whale Sharks. Not only did Juan give this brief in English, but in Spanish and French for the 10 members of today's group. Juan explained when we got in the water to stay with the head and swim with the shark, because losing the head it would be hard to keep up with get back in front. We were also told that for regulations we were required to wear a lifejacket for the boat ride and Swimming With The Whale Sharks. He informed us, if we would like, for the swim we could rent a shorty wet suit so you would not have to wear a lifejacket. Have you ever tried to go under water with a lifejacket on? I chose the shorty wetsuit. Arriving at the dock we were given and fitted with snorkels, masks and fins provided by Eco Color Tours. We were then introduced to our water guy, the one that would actually swim with us, "Buda" it was explained that Buda would take 2 of us at a time for the swim then we would rotate to the next couple. Off we went, destination about 1 1/2 hours out from Cancun, about 20 miles past Isla Mujeres into the Gulf of Mexico. After about 10 minutes we noticed several other boats joining us. Pretty soon it was like a cannonball race out to the whale sharks. Arriving on the location of the Whale Sharks, there must have been about 40 boats, with a group of 20 to 30 Whale Sharks. This trip I was able to get 3 swims with the Whale Sharks. The first swim, my wife and I slid off the side of the panga with Buda, adjusting my mask and clearing the fog, I lowered my head into the water and was surprised to see the Whale Shark coming right at me. In the neighborhood of , I guess 20 to 25 feet long, looked like 50 feet for the fish story, I was mesmerized. With my GoPro camera I filmed as the Whale Shark approached and started to pass, filming the entire body with gills flapping and then getting bumped by the tail, the tail had to be at least 6 to eight feet in height, I started to swim to catch up to the head. Remember back to when Juan the guide said "stay with the head" well for me it was a all out sprint to catch up, by the time I caught up I was exhausted. After what seemed like forever(actually less than 10 min) I gave up and headed to the boat. Second dive, left my wife on the boat and head out with one of the French people, not that it matter, we weren't going to be doing any talking. The captain positioned us in front of the oncoming whale Shark that we could see just below the surface. Sliding in again and looking to where I had last seen the whale shark, I noticed that it had descended to about 30 feet. Not to waste my turn I dove down about 20 feet to be able to film and get a closer look. After several minutes the whale shark rose back to the surface, a very impressive sight. Again 10 minutes out but totally exhausted. Third trip, Buda, our water guide offered to film me with the Whale Shark. Jumping in there was actually 2 Whale Sharks. I swam to the closest one, which out of the 3 dives I think was the largest, at least 30 to 35 feet looking like 60 feet. Swimming along and keeping up with the Whale Shark I tried to dive down to come under and up the other side, with the Whale Shark being down about 10 feet and about 4 to 5 feet thick and me fighting the buoyancy of the shorty wetsuit I was unable. Once again I returned to the panga totally exhuasted. Eco Color Tours provided us with drinks and sandwiches out at the swim area. Finishing everyone's swims we headed back . 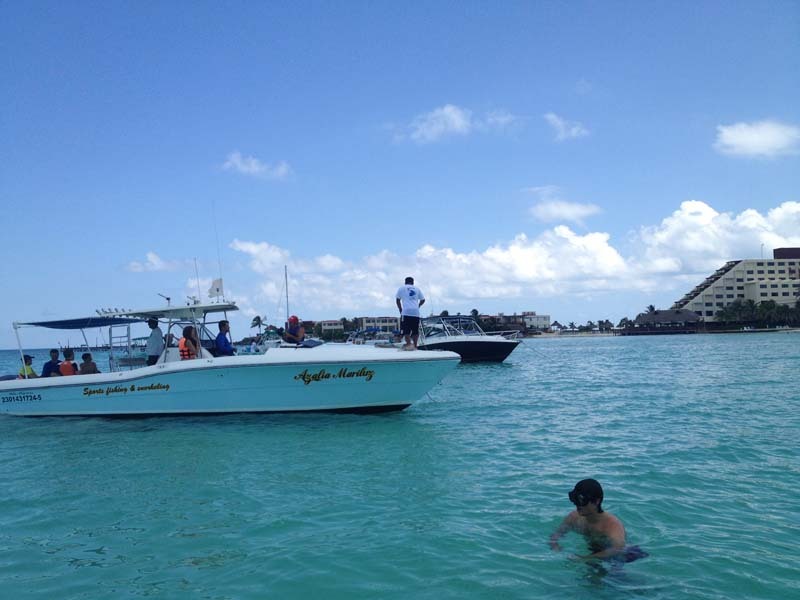 A stop was made just off Isla Mujeres where we were able to swim in shallow water. The crew from Eco Color tours made us ceviche and more sandwiches. Overall , we could not have asked for a better day, perfect weather, fantastic crew and numerous Whale Sharks to see. I think all 10 people on this tour agreed that this was a well worth trip. Another boxed checked off on things to do in one's lifetime. On arriving at back at the hotel I quickly looked at the video, seeing that I had some great shots, I was pleased. One thing that I did notice in the video was the plankton and bubbles passing by. In what I thought was the Whale Shark swimming fast was actually the current making it hard to keep up with the head. Looking at the video I am guessing the current was going about 4 to 6 knots. While backpacking throughout Europe or other parts of Central and South America can also deliver an amazing experience, the language barrier can often prove to make traveling difficult. Unless you're bi- or multi-lingual, hopping from country to country isn't always easy. One poor turn and you could be lost and clueless. Because Belize is a British Commonwealth, English is its first language – and is the only Central American country where this is so. The lack of language barrier for native English speakers makes it incredibly easy to get around or to ask locals about great local eateries or sites. Belize has one of the best bus systems in Central America, and it is incredibly cheap. Backpackers can get to nearly every corner of the country via the Hummingbird, Coastal, or Southern Highway for around 7 USD. Not only are the buses cheap, but they also offer a great way to interact with locals. 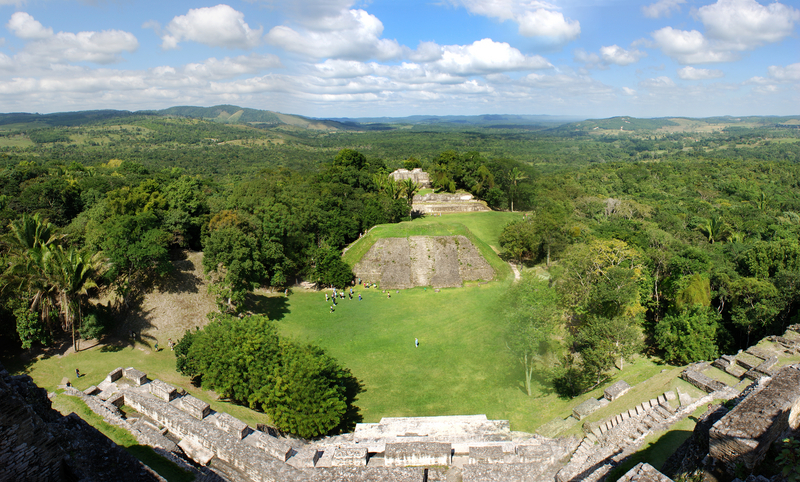 Flights to Belize from the States are also relatively inexpensive. A flight into Belize City or into Cancun, which is only a short taxi away, can easily be secured with the miles saved from a Capital One Venture 100,000 card or another frequent flier card. Belizeans are some of the friendliest people to travelers. If you happen to hop on a wrong bus or are simply looking for a great place to grab an authentic meal, they will be more than happy to point you in the right direction. For backpackers, the Belizean willingness to help is often a godsend, and can provide a much more intimate look into the little country. Because of Belize's history as a backpackers' paradise, lodging is incredibly easy to find, and rarely requires reservations. If you stay away from the touristy cayes, such as Ambergris, you will easily be able to find a hotel or bed and breakfast room for around $30 a night for a single to two person room. In more touristy areas, prices are higher, but again, rarely require reservations. For backpackers this is great, as it allows them to pick and choose how much time they would like to spend in certain areas and travel on a whim when necessary. In Belize, the US Dollar is just as good as the Belize Dollar, and nearly every vendor is willing to accept US currency – if not more so than their own Belizean dollar. This is great for US backpackers because it keeps them from having to exchange currency or paying currency exchange rates. Major cities, such as Belize City, San Ignacio, and Dangriga, all have ATMs as well so you don't have to carry around large lump sums of cash. However, that doesn't mean that you should avoid bringing a credit card with you for emergencies. A good no foreign transaction fee credit card can be a life saver when cash is lost or stolen. 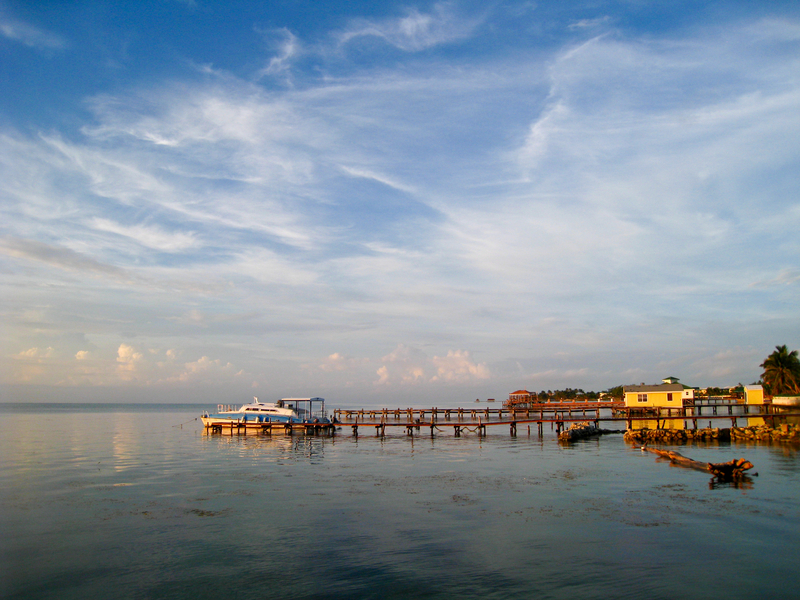 While staying in a luxurious resort is often what many think of when considering vacation, they shouldn't shy from a backpacking vacation in Belize. Although the country does offer 5 star stays, it is on its open roads where the country can truly be found. So if you are looking for a bigger adventure for your next vacation, consider grabbing a backpack and heading to Belize. The diverse countryside and friendly people will be sure to do anything other than disappoint.